The following will appear as Appendix 4 in the third edition of Mohammed's Koran. In Germany in the 1930s the state and big business collaborated to discriminate against Jews and to silence Jewish objections to this hatred. That’s where we are now. The concentration camps were preceded by Jews being banned from universities and banned from journalism. When the Nazis occupied France, this discrimination was imposed by the Vichy regime on Jews there too. Only this time the victims of this discrimination are the citizens of Western democracies, who are prevented by the state and big business from expressing the truth about the history of Islam or the threat that Islam poses to non-Muslims. If the argument or evidence in Mohammed’s Koran was flawed Muslims and academics would have refuted the book in reviews. If the argument was inconsistent, one would expect even journalists would have been able to refute Mohammed’s Koran. Instead, in our so-called “liberal democracies”, the book was systematically censored. For a long time we have warned that mass censorship is coming. Here’s the story of censorship in relation to Mohammed’s Koran, the first No.1 best-selling book to be banned in the age of tolerance and diversity. Mohammed’s Koran denounces the hatred found in the Koran and denounces the Koran’s calls for Muslims to kill non-Muslims. It’s as if we published an annotated edition of Mein Kampf where we highlighted and denounced the hatred and the call to kill Jews in Hitler’s book, and this annotated edition of Mein Kampf was banned. We must be silenced because they cannot refute the truth. Amazon’s actions in banning Mohammed’s Koran have corroborated the main argument made in the book: the elite do not want the public to understand that the Koran commands Muslims to kill non-Muslims, and for over 1000 years it has been accepted by Islamic scholars that the commands to kill us cancel out (abrogate) any instructions in the Koran which appear to guide Muslims towards peace or tolerance. The book Amazon banned provides the clearest illustration in history of the effects of abrogation on the meaning of the Koran. Those Korans which promote violence as moral behaviour (and which are regarded as the final and holy word of god) are still on sale. Amazon banned the book which irrefutably decodes the Koran, the book which would assist the public in taking civilized action to curb the growth of this genocidal ideology. The followers of Islam can freely distribute copies of their book which calls on Muslims to kill us; the victims of Islam are not permitted to know what this evil book has in store for us. Imagine if Jews were forbidden from publishing books denouncing Nazism. It is clear that we non-Muslims are not permitted to criticise the ideology which has inspired over 30,000 terrorist attacks since 9th September 2001. 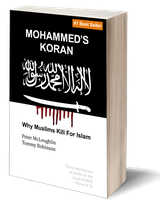 Customers were amazingly enthusiastic about Mohammed’s Koran (as evidenced not only by the sales of a book ignored by the media, but also by the 1,000 “verified purchaser” reviews left by readers, almost all of which gave the book the maximum five stars). Amazon are following orders from above, and what the customer wants is irrelevant when the crypto-fascist state demands the suppression of information. Imagine how delighted the KGB, the Stasi or the Gestapo would have been to have had a monopolist like Amazon doing their bidding, destroying any book that exposed the lies of the state. In July 2017 when Mohammed’s Koran was first published, it went straight to No.1 on Amazon UK, and remained at the No.1 spot until the first print run of 5,000 copies had sold out five days later. Before Amazon would distribute the book through the Kindle programme or through print on demand they made it clear they would vet the content of the book. They did so, and it passed the first hurdle. In those first few weeks following publication Amazon contacted the authors to say that the book had been reported to them as "hate speech" and that Amazon were investigating these claims and if found to be true the book would be banned by Amazon. A week later Amazon informed us that despite the calls to have it banned, they were not going to ban it. Thus Mohammed’s Koran was twice cleared by Amazon for distribution by them. From then on, every couple of months they would email the authors asking to put the book into a special category of Kindle promotion which would allow Amazon to gouge even more of the profits from the book (Amazon kept most of the cover price of both the print on demand book and the Kindle ebook). So Amazon sought to profit as much as possible from the sale of the book which they had twice cleared as suitable for distribution. Back then Amazon ignored the demands to ban the book which came from Communist newspapers. Eighteen months after the book first went to No.1, Amazon emailed us to say that the book was banned because it was "in violation of our content guidelines". Following the ban, repeated requests from us asking what they found offensive (and what had changed since they gave the book the all-clear in 2017) were ignored by Amazon. On more than one occasion Amazon staff have falsely reported to complainants that the authors had deleted the book from the Amazon website. When these Amazon customers informed us of this we pointed out that only Amazon has the power to delete entries from their database and we provided the email from Amazon where they stated they were banning the book. Amazon sent one customer a transcription of his interaction with them, showing that Amazon not only record conversations with customers but also automatically transcribe these conversations. This should come as no surprise to anyone since it has recently been exposed that Amazon staff eavesdrop on the conversations of customers who use Amazon’s voice toy, Alexa (“Amazon workers are eavesdropping on your conversations with Alexa”, Metro, April 11th 2019). Having proved to Amazon customers that Amazon staff were deceiving them, one customer contacted Amazon a second time and complained about this deception. Amazon staff responded by saying that Mohammed’s Koran had been banned in the wake of Tommy Robinson exposing the BBC’s lies in their flagship documentary series Panorama. Just two days after Tommy released his documentary (entitled Panodrama), Amazon banned the only Koran which denounces violence. In the conversation with their angry customer about Mohammed’s Koran being banned, Amazon also said that the order to ban the book had come from above Amazon. As the Amazon customer asked in surprise: “What’s above Amazon”? The UK government? Significantly, this time Amazon did not send their customer a transcript of this second conversation. Being wise to the fact that Amazon were recording these conversations, the customer also recorded the conversation and sent us the recording. We thank him for his foresight. Following Tommy’s exposure of the extent to which the premier state broadcaster (Britain’s Ministry of Truth) was prepared to fabricate material in order to destroy a man’s life, Tommy was then censored and permanently banned by companies such as Facebook, Instagram, Snapchat and others: more global corporations prepared to do the bidding of the British state. The deputy leader of the socialist party in Britain wrote a public letter to Google, demanding that they ban Tommy from YouTube. A few weeks later YouTube bowed to their political masters, hiding Tommy’s videos from other users, ensuring that the media lies are the dominant account of what Tommy says and what he does. In Orwell’s 1984 Emmanuel Goldstein is branded an enemy of the state, and only Big Brother is allowed to present the views of Goldstein. In the 21st century the collusion between multinational corporations and the fascist state is more obvious now than it was during Hitler’s time in government. So much for “liberal democracy”. That the British government would want Mohammed’s Koran banned comes as no surprise. Since we had been publicly discussing the book in the months before publication, the Quisling elite had time to get their propaganda in place. No sooner was the book published than state-funded organisations were taking out adverts on Google’s search results, intercepting any search for “Tommy Robinson’s new book” or “Mohammed’s Koran” with an advert for a series of expensive, professionally-made videos warning people not to read this book! Google would not take adverts from us for key phrases relating to the book, but they would take adverts for such phrases from people who wanted to stop the public reading the book. In this way these huge monopolies (who pay virtually no tax in the UK) work hand-in-glove with the state’s efforts to shape what the public knows. So much for Google’s slogan “do no evil”. As you might expect with Amazon following orders from on high to ban this book, Amazon is absolutely inconsistent about what they ban. It is highly significant that Amazon still sells Hitler’s Mein Kampf (a book which openly advocates the gassing of Jews, which doctrine was then put into practice in Auschwitz and other death camps). It’s not that Amazon is merely allowing third parties to sell Mein Kampf: Amazon is the seller profiting from a book which was the foundation of the Nazi policy to exterminate the Jews. So much for Amazon’s “content guidelines”. Amazon still sells The Anarchist Cookbook, a bomb-making manual which has resulted in people being jailed for terrorism (“Publisher of Anarchist Cookbook convicted under Terrorism Act”, The Guardian, 9th Mar 2011). A few years ago Amazon famously refused to ban a book promoting paedophilia, with Amazon saying “Amazon believes it is censorship not sell [sic] certain books simply because we or others believe their message is objectionable” (see “Amazon Under Pressure for Selling Pedophilia Book”, CNBC, 10th Nov 2010). The only Koran Amazon has banned is also the only Koran which denounces violence. All those Korans which promote the hatred of non-Muslims are still for sale. Amazon is still selling those Korans which tell Muslims they will go to Paradise if they become Jihadi murderers. What are those “content guidelines” Amazon? Before Amazon became a modern-day book-burner, our Koran which denounces violence was also the No.1 best-selling Koran in the UK. Now you can’t even sell a used copy of our book through Amazon’s website, so extensive is this ban! If there were any Korans which should have been banned it was all those Korans purporting to be the final word of god and which command that Muslims should unquestioningly kill us non-Muslims. Those tracts of violent hatred are permitted and promoted by Amazon (just as Mein Kampf extolls the mass-killing of Jews). Under English law a company is assumed to be a monopoly if it controls 50% of a market (and if its competitors are much smaller, then the company is judged to be a monopoly with considerably less than 50% of market share). The book trade is not even able to estimate the size of Amazon’s control of the book market (Amazon are highly secretive not only about why they ban books, but also about the scale of their monopolistic practices). In a 2010 submission to the British government opposing Amazon’s purchase of a competitor, The Booksellers Association stated that between 2008 and 2010 the share of books sold over the internet rocketed from 17% to 44% of all sales in just two years (there is no reason to believe that a similar trajectory did not continue for the following decade). The same report states that in 2010 Amazon already had 70% of internet sales (before Amazon bought their small, but fast-growing competitor, The Book Depository). Still, the British government, which purports to favour competition, permitted Amazon to buy up their fast-growing competitor (Amazon owns other "competitors", such as Abebooks). The report by The Booksellers Association estimated that in 2010 internet sales accounted for approximately 50% of all sales of books outside of supermarkets, book clubs and bargain book shops. There is every reason to assume that Amazon now totally dominates the market for serious books bought outside university bookshops. If their explotitation of this dominant position did not suit the state, then they would not be permitted to maintain their monopoly. When Amazon banned the only Koran which denounces Islamic terrorism, they also deleted around 1,000 five star reviews from very satisfied customers. Luckily many of those reviews were backed up on the website which accompanies the book (see inside front cover of the book for details). But don’t think that Amazon is alone in banning this book. In the UK the largest chains of book-sellers (such as Waterstones and Foyles) have refused to supply Mohammed’s Koran to customers (Muslim propaganda organisations are on record claiming they are responsible for this). In the US we have had a number of reports of customers going to Barnes & Noble and Books-a-Million to order copies, only to be told that the book cannot be found in their databases and therefore cannot even be ordered (something the bookshop staff reported they had never seen happen before with a book that was still in print). When the book was first published the British police threatened the launch venue with bankruptcy should they go ahead with the launch. All of these small details are part of a larger project. When Professor Guy Millière left the toxic environment of France for the freedoms of the USA, he gave a speech where he noted that it was impossible to go into any bookshop in Paris and find a book that was critical of Islam (we’d already observed this fact in the major bookshops of London). Such books are being driven off the internet too. Perhaps now it becomes clear why the UK government is proposing to censor the internet itself, making Britain as fascist as Saudi Arabia, Communist China and North Korea, places where no criticism of the orthodox truth is permitted. In a few years we expect it will be illegal in the UK to criticise Islam (as documented in Peter’s book Easy Meat, between 1997 and 2006 the UK government attempted over and over to covertly pass such a law and came within one vote of succeeding). In the meantime the “Conservative” government in Britain is funding AI projects to automatically prevent “Islamophobic” comments from existing anywhere on the internet. Here’s our promise to the fascists who ban books: when it becomes impossible to print Mohammed’s Koran or impossible for us to get these printed copies into the hands of the public, then the book will be made public domain. In those circumstances anyone will then be able to distribute it for free or print it for themselves and others. When there are no publishers, printers or retailers blocking this book, then you fascists will have removed any obstacle in the way of anyone who wants to spread the truth about Islam. You are not going to prevent the victims of Islam from understanding that we are offered two choices by Islam: submit or die. The British government and most of the publishing industry have chosen submission. Amazon have now set the precedent. In the West the Koran can be banned and journalists will applaud such a ban.